This burgundy HP Pavilion laptop is a stylish model that makes light work of everyday tasks. With an impressive 10 hour battery life, it offers the freedom you need to work on-the-go. It’s great for streaming movies and boxsets as well with a super-clear Full HD display. 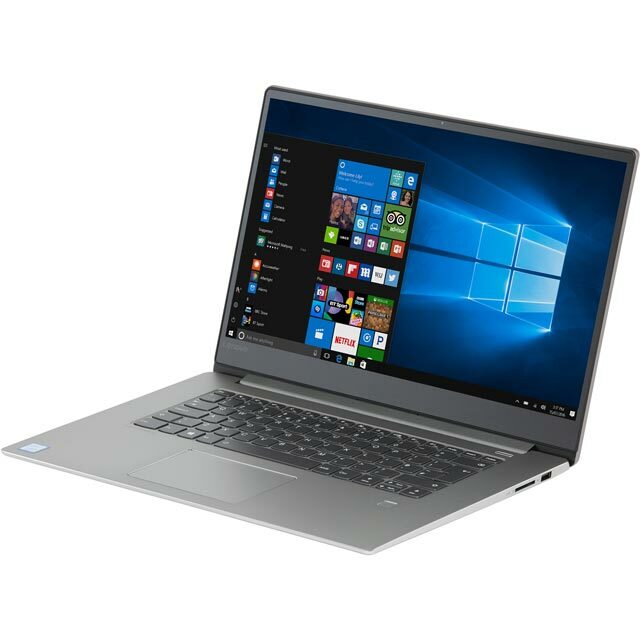 Plus, this model has plenty of space for all your files with a 1TB HDD, while a rapid 128GB SSD gives you super-fast loading times. And with the AMD Ryzen 5 processor and 8GB of RAM, you’ll enjoy brilliant performance while you work or play. 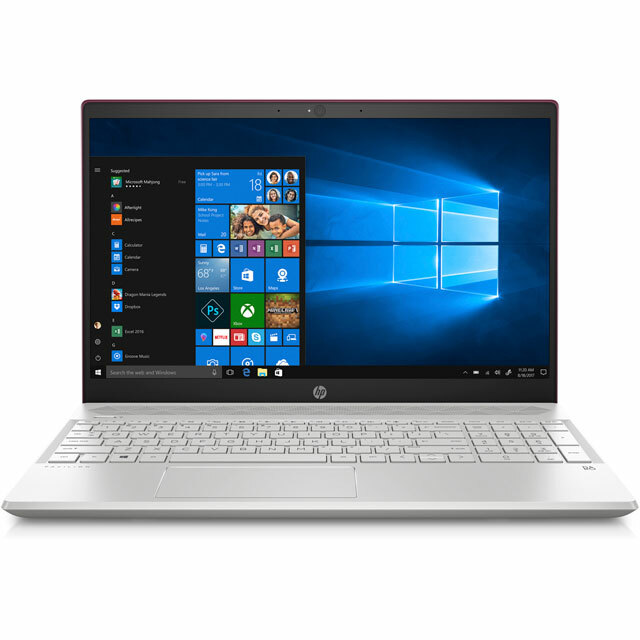 Don’t forget to pick up a copy of Microsoft Office and an antivirus package,to get the most out of your new HP laptop. The sleek and slimline laptop makes it a perfect model for taking out and about. It’s designed to be both thin and light, so it can be easily slipped into a bag or backpack without weighing you down. So whether you’re wanting to get a jump on the days’ tasks on the train, or are just in the mood for a change of scenery, it’ll let you get your head down wherever you fancy. HP’s micro-edge display on this laptop gives you a spectacular field of view. By reducing the wasted space at the edge of the screen, you get a much more immersive experience and a stylish modern look to boot. This makes watching boxsets and movies that much more enjoyable, and documents and presentations will look extra impressive too. Experience exceptional sound quality with audio by B&O Play. Bang & Olufsen have an incredible reputation for producing some of the best sound systems in the world and in this model they’ve brought their years of experience to the world of laptop speakers. This means that no matter what you’re doing, you can expect breath-taking, immersive audio. There’s plenty of options for attaching extra devices, thanks to this model’s USB 3.1 and USB Type-C connections. The USB 3.1 gives super-quick file transfers, ten times faster than the older USB 2.0 connection, whereas the USB Type-C is ideal for syncing up your smartphone and backing up all those photos of you and your friends. Staff at AO.com helped me set up security and office software. only one months free trail with the product. Shame the laptop did not come preinstalled with these products as standard, included in the cost. struggled to get a mouse to operate with the system. No instruction about the being buttons enclosed in pad. when you switch from a Dell to HP took time and someone to show me how to use this. This is a great laptop, it was so easy to set up. I would recommend anyone to try it. 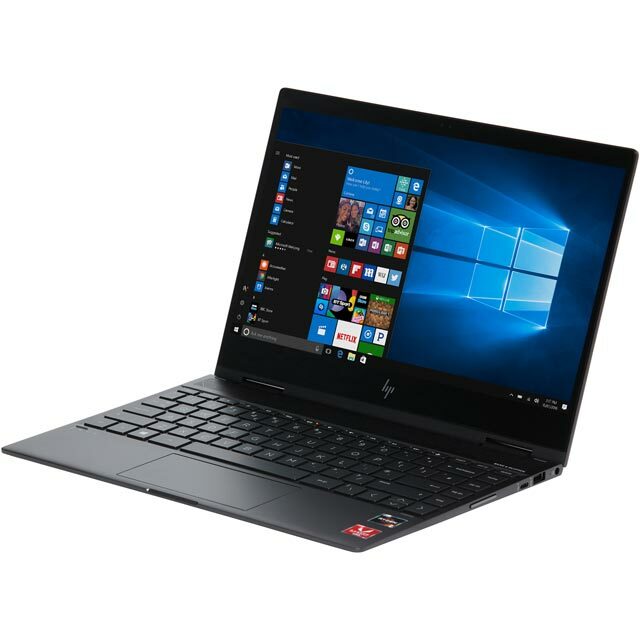 After purchasing one of these laptops just before Christmas 2018, I was amazed for the at what an excellent laptop this is for the price, its quick when opening many files, fast when browsing the internet the only downfall is the memory copacity but i didnt by for that reason, i also play all my favourite up to date games on this as it has a pretty decent graphics card, its just an all round decent laptop thats worth the money so much so I decided to by another for for my other half February this year. 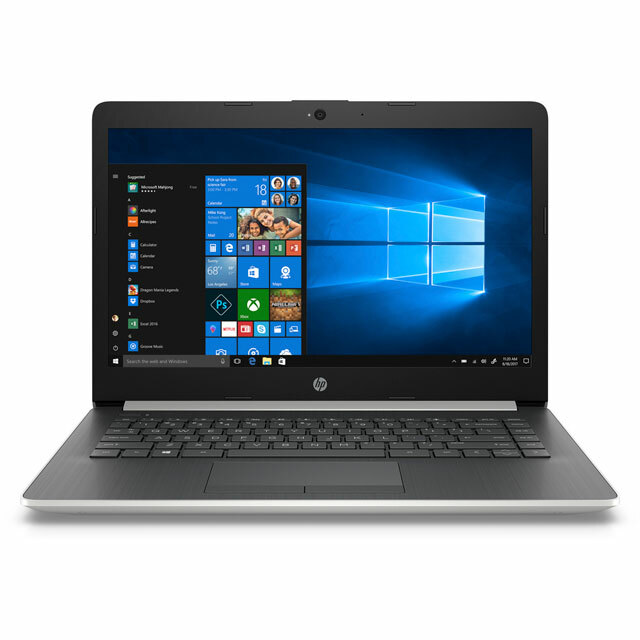 I spent a lot of time researching which laptop to purchase for my 15 year old son moving into his final year of school. The spec on this laptop was excellent - more than enough for studies social use. 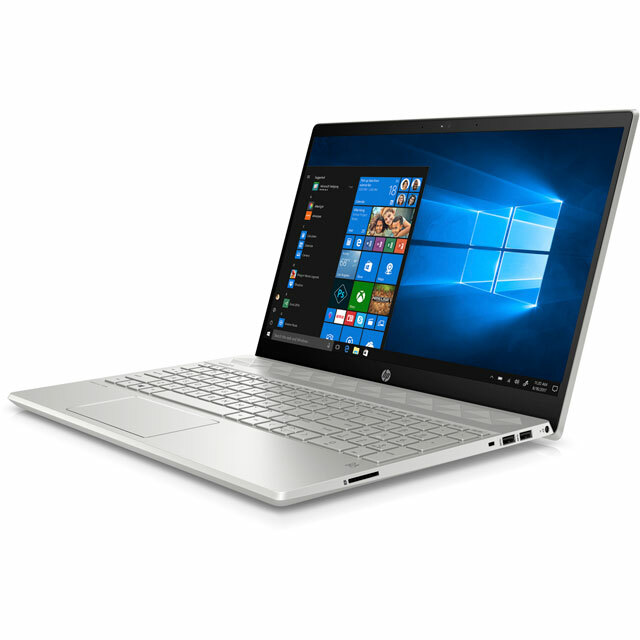 What pleased me as much as anything was the build quality - HP are a strong brand and I was not at all disappointed. I use AO for most large purchases, the price match is a great safety net, but in most cases as this one the price was as good as I could find! Pros: Seems to be one of the only mid-range laptops on the market currently that comes in a variation of beautiful colours. Loved the keyboard layout with the num-pad included - quiet and easy to use. It is slim and lightweight. The new windows seemed fairly straight forward and easy to use. Cons: The operating system seemed slower than what I would expect from the specs. The B&O sound was crackling and HP diagnosed a fault with either the sound system or the mother-board itself. The build of the laptop is rather flimsy - it gives you the feeling that you could break it by just placing it on the desk too quickly and the screen tilts back only until a rather small degree opening, making it hard to see the screen if you don`t place/hold it in a certain angle. Summary: I only had it for a day before returning it due to the existing fault and although I may have just been unfortunate to receive a faulty one-off item from a batch of good ones, I will not be investing in an HP (or other american brand) anytime soon. Lots of memory and pretty swift. Simple to set up and easy to run.